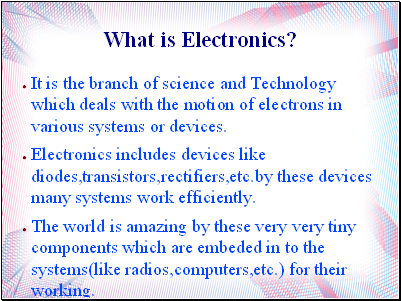 ● It is the branch of science and Technology which deals with the motion of electrons in various systems or devices. ● Electronics includes devices like diodes,transistors,rectifiers,etc.by these devices many systems work efficiently. ● The world is amazing by these very very tiny components which are embeded in to the systems(like radios,computers,etc.) for their working. 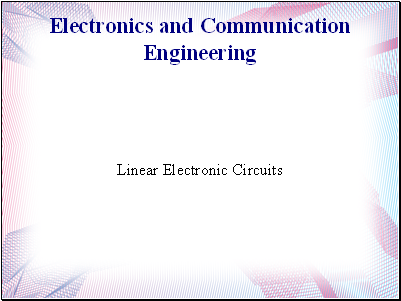 ● It is any closed system consists of various components(Electronic) linked to each other to make a circuit functional. 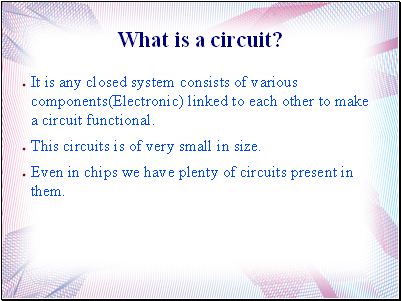 ● This circuits is of very small in size. ● Even in chips we have plenty of circuits present in them. 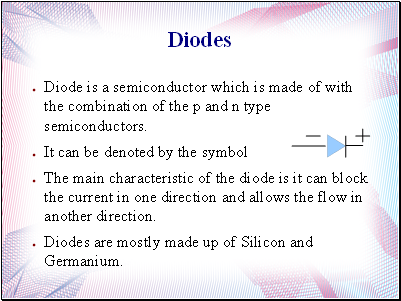 ● Diode is a semiconductor which is made of with the combination of the p and n type semiconductors. ● The main characteristic of the diode is it can block the current in one direction and allows the flow in another direction. ● Diodes are mostly made up of Silicon and Germanium. 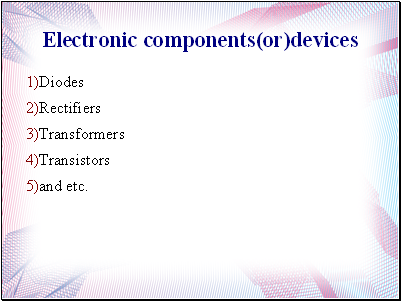 ● Number of diodes are used in rectifiers. ● If only one diode is used in a rectifier it is called as a rectifier the only difference is a rectifier converts AC current to DC current. 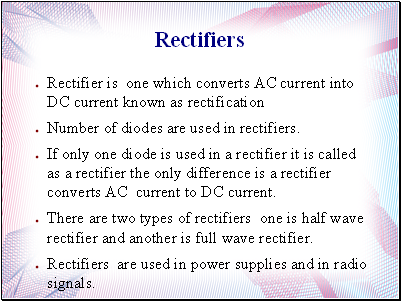 ● There are two types of rectifiers one is half wave rectifier and another is full wave rectifier. ● Rectifiers are used in power supplies and in radio signals. ● These transformers also did the same thing as rectifiers as taking ac voltage or current throught it and convert it to dc supply. 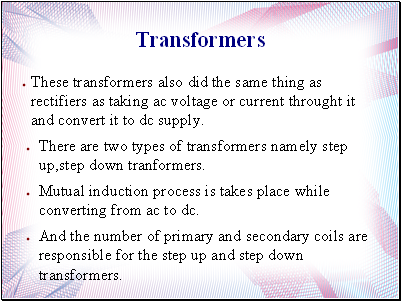 ● There are two types of transformers namely step up,step down tranformers. ● Mutual induction process is takes place while converting from ac to dc. ● And the number of primary and secondary coils are responsible for the step up and step down transformers.